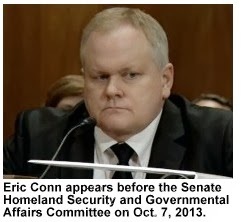 Current and former Social Security Administration employees testified Oct. 7 that they were persecuted and harassed for speaking up about alleged collusion between a disability lawyer and a judge. “Management has been allowed to harass, intimidate, oppress, stalk, discipline, ostracize, monitor and make my life as miserable as possible for the last 7 years,” said Sarah Carver, a senior case technician at the SSA’s regional Office of Disability Adjudication and Review in Huntington, W.V., before the Senate Homeland Security and Governmental Affairs Committee. According to a report from the committee, David Daugherty, an administrative law judge at the SSA office in Huntington, colluded with Eric Conn, an attorney in Stanville, Ky., to approve at least 1,800 claimants for disability benefits. The bank records of Judge Daugherty and his daughter contain $96,000 in cash deposits that he has refused to explain, while Conn received more than $4 million in attorney fees from his SSA cases. Located in a town of 500 people, Conn’s firm was the third highest paid disability law firm in the country thanks to its SSA fees, the report says. Carver, who still works at the SSA office in Huntington, said at the hearing that it was not difficult to observe the scheme between Conn and Daugherty. “It was done in such openness,” she said. Daugherty, who has retired from SSA, personally assigned himself Conn’s cases, holding up to 20 hearing for his clients in a single day, while most judges held 15-20 hearings in an entire week. He approved virtually all of them, “in assembly-line fashion,” the report says. Other judges approved disability benefits in about 60 percent of cases. Griffith testified that when she discovered the improper docketing of cases, she thought her supervisors would be glad to hear that she had found the issue and could correct it. Instead, she said, she was persecuted. “At one point, my supervisor would time every action I took during the day, including how long I spent in the bathroom,” she told the committee. You are currently browsing the archives for the Social Security Administration category.